One thing that has been keeping me busy recently is the fact that I am now a Pink Spa Consultant! 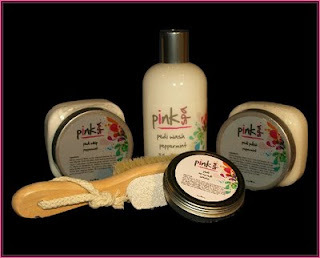 Pink Spa is a relatively new company that's growing by leaps and bounds. It's all about relaxing and having fun in a spa party environment with your friends and family. Their products are great and come in a wide variety of scents. I got my starter kit last week and have been enjoying sniffing & trying out all the different products. (My favorite scents so far are Tuscan Lace and Pink Sugar!) My first party is coming up shortly and I'm very excited. I recently started a Facebook page (you can see it here at Pink Spa by Shay) where I'm having a referral contest. Check it out ~ the person who refers the most people to my page wins a free Pedi Polish! Hi there, not been blogging in a while. Thought I'd stop in and say Hi. Who wouldn't love spa stuff. It sounds like a really great line of products! Fun packaging too! Best wishes!